I feel more at home with oil paint than any other media, as I prefer to blend colors often on the surface. Acrylic paint due to its fast drying quality makes it difficult to maneuver while working, unless one is very quick. Hence, I keep trying different styles with acrylic paint. This is one such trial painting. 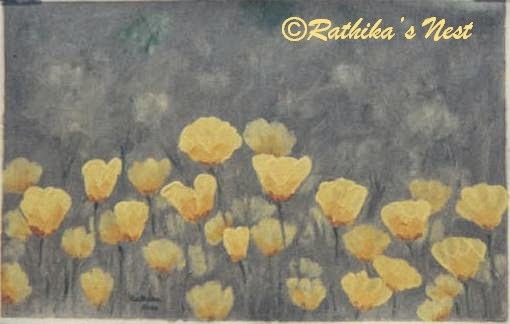 I particularly like the golden yellow flowers showing prominently against the darker background. As usual, I have used limited palate comprising Titanium white, sap green, yellow ochre, permanent yellow medium and burnt umber. I have tried bold brush strokes to capture the flowers, blending in colors as I moved towards the edges of the flowers in the foreground. Acrylic paint diluted with matte medium has been used to complete the background with crisscrossing broad brush strokes.